Bottom Line: Wristop,Computer and Advanced-tech watches still have a long way to go before general consumers and watch aficionados will consider them for normal use. But until then, both Fossil and Suunto have made commendable efforts in keeping the idea behind a wearable computer-esque tool alive. Remember over a year ago when Fossil listed their PDA watch on Amazon? Yeah, those sleek wristwatches boasting Palm OS and a selection of styles including concepts for sporty, casual, and business designs that everyone had labeled "vaporware." Amid a slew of delays and setbacks, Fossil finally released it. 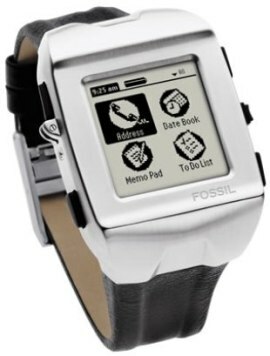 Called the FX2008, the Fossil PDA watch is finally available to consumers. The Palm OS 4.1 powered wristwatch acts as a personal organizer, can run virtually any compatible program, and features instant syncing and text input abilities. However, Fossil is not the only smart watch company to upgrade its tech watch lineup. Suunto recently rolled out an update of its N3i SPOT watch, the n6HR. Designed for those with an active lifestyle and sports enthusiasts, the n6HR comes with a heart rate monitor and software for managing and analyzing your training. It also features a redesigned body and durable metal strap to withstand more rigorous training sessions. However, besides the $400 price tag, there are still some factors that will make adopting this watch for everyday use difficult. But for those who want the MSN Direct service in a feature-rich sports watch, the n6HR is a decent investment. 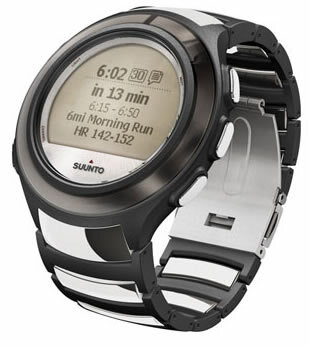 As for the FX2008, it is at $250 significantly more affordable than the Suunto. But which, if either, watch provides the best features for its price? Read on to find out.